Coupon not valid with any other offer. Must present coupon or show smartphone at time of write-up. Limit one coupon per person. Coupon does not apply to prior purchases. Other Restrictions may apply. Void where prohibited. with any Major Audi Service. Limited number of loaners available. MUST call for an appointment. 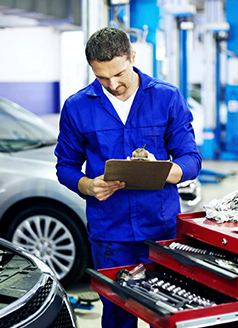 Get a comprehensive visual inspection of important safety & drivability items. We Offer Complimentary Pick Up & Delivery Valet Service! Audi Farmington Hill's "Valet Service" is an exclusive and complimentary added service for those who may find it inconvenient to come to our dealership for service. 2. Pick your Audi up. 3. Leave you a COURTESY Audi Service Loaner. 4. Bring your vehicle back when service is complete. Audi Farmington Hill's factory trained staff will perform the "Valet Service" pickup and delivery. Arrangement can be made for either home or workplace. Pickup and delivery must be made at the same location. - Pickup and Delivery times are from 8:30am to 2:30pm, Monday thru Friday. - You must provide "proof of insurance" for record. - You must schedule the "Valet Service" in advance.